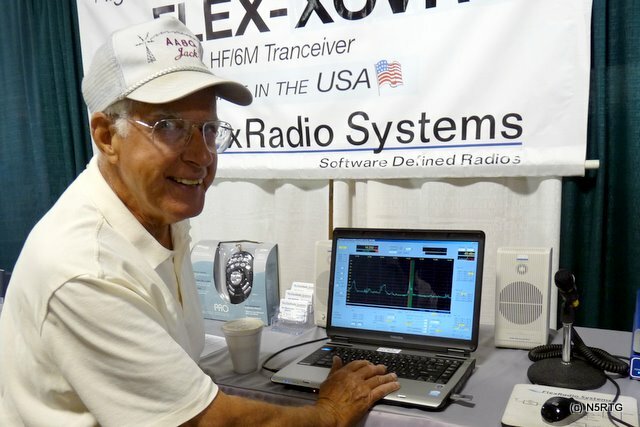 We’ve just returned from the 63rd Anniversary HamCation, a huge honkin’ convention of ham radio operators and electronics vendors from all over the U.S. We camped on the Central Florida Fairgrounds (Orlando, FL) with more than 45 other members of the RV Service Net and hundreds of other amateur radio operators and vendors. The RV Service Net, sponsored by WBCCI Amateur Radio Club, is a North American organization of amateur radio operators dedicated to (1) service to the public, (2) furtherance of public welfare by relaying messages via ham radio in time of need and emergency, (3) promotion of education and interest in the sciences of amateur radio, (4) promotion of fellowship and goodwill among all radio amateurs and the public. And we get to put a face with a callsign at the RV Service Net Ham-a-Rally preceding the HamCation and at really great afternoon socials. Members of the RV Service Net meet several times annually at regional events across the continent, and can meet on the radio every morning and afternoon on scheduled nets to check in with each other. We’ve made good friends with this bunch of hams and enjoy face time at the conventions and other times we see them. This is our second Orlando HamCation and our fourth ham convention in the past three years. We saw no evidence of a recession in the interest and purchases at this hamfest. Vendors we talked to said they had a good show and people were spending. Attendance seemed strong on the grounds and in the exhibit halls. We saw a lot of hams and vendors (most of them seem to be hams, too) parked their RVs on the grounds. The convention vendor booths opened Friday at noon. We were glad we had browsed all the vendors’ booths Friday while we still had elbow room. The greatest attendance occurred on Saturday, and the exhibit halls were completely crowded. Since our campsite was only 400 yards from the exhibit hall we opted to dine and relax during the busy times. We could purchase a part, take it back and try it out in our ham shack (in our Airstream) and walk back and discuss any questions or comments we had with the vendor. The proximity to the vendors was instrumental in working out several issues I had with my antennas. My rooftop motorized antenna can receive and send on eight amateur radio bands (80m, 60m, 40m, 30m, 20m, 17m, 15m, 12m). I must manually retune the antenna to resonance as I switch bands so I’ll get proper receive and transmit performance. I have been having problems with retuning. Thanks to John Bee N1GNV at Quicksilver Radio Products I am now much faster and more accurate at tuning. John gave me exactly the help I needed. John has been at every hamfest I have and has unfailingly given me helpful tips and good direction. John, over the past three years, sold me most of my Anderson power pole connectors, my Rig Runner 12v outlet strip, wire, and an antenna tuning switch. Most importantly, he has sold me on his credentials as an experienced amateur radio operator who humbly and capably represents his products and how to use them. And John has a lot of peers who, like him, are experienced ham radio operators who vend at the hamfests. I suppose any good vendor exhibit will have a lot of experienced people representing their companies’ wares. A defining difference between hamfests and some product shows/conventions, I think, is because amateur radio is a hobby. The vendors, almost to the last man and woman, are licensed amateur radio operators. Any accounting of a hamfest would be vastly incomplete without mentioning the flea markets and tail-gaters. I think at least three hundred booths were set up inside and outside with the tables full of old computer keyboards, wireless phones, headsets, oscilloscopes, military surplus electronics gear, and whatever else you can name. We spent most of our time amongst the vendors representing new parts and equipment. But, by far, most of the people selling at hamfests are those selling used or salvage parts and equipment. Every hamfest we’ve attended has just over a bizillion vacuum tubes for sale. Here too, at HamCation, we encountered the old collections. Did this event stimulate the economy? Our impact on the stimulation of the US economy is suppressed by the size of our small home on wheels. We just don’t have a lot of room to store stuff and, without incomes, we really want to choose carefully how we spend. Still, we probably had more effect on the economy than the Federal stimulus plan will. Was this hamfest worth it for us? From our esteemed vendors we bought an antenna tuning switch, a few coax connectors, an antenna whip, a roll of tape, four fuses, and a small ferrite bead. We paid the Central Florida Regional Fairgrounds four nights for camping. We had already paid for site rental in Okeechobee so the extra site rental cost is lost money unless we found some great benefits. Number One Benefit? With our RV Service Net friends we gained deeper friendships, great contacts from all over the U.S., and had a lot of fun. I recall our discussion on your Orlando trip. Glad it was a success and you ventured out from Ancient Oaks! We enjoyed rain, plunging temperatures and then snow on Saturday. Our Airstream had icicles! !